Many children around the world develop a passion for soccer because the game is so easy to fall in love with. A ball and a couple of sweaters to use as goal posts are all that is required for a few friends to get together for an informal kick around, but proper footwear will be called for as their skills develop and the games become more important. While the sport has traditionally been played on natural grass surfaces, the rising popularity of five-a-side games and futsal has led to athletic apparel companies releasing a bewildering array of soccer shoes designed specifically for playing on artificial surfaces. There are two main types of artificial surface used for soccer, and wearing the wrong type of shoes could lead to poor performances or painful injuries. Traditional turf playing surfaces are little more than a carpet of artificial grass with sand added to provide traction, and the unyielding nature of this configuration calls for flat rubber soles. One benefit of this type of shoe is that it can be worn on the street. However, sand based playing surfaces have not really taken off in soccer circles because the ball bounces unnaturally and flat-soled shoes can make precision passing and powerful shooting difficult. A new type of synthetic surface was needed, and 3G developed an artificial pitch containing small rubber pellets. The 3G surface provides more give, and artificial turf soccer shoes designed for playing on this kind of pitch feature a pliable rubber sole with small studs to provide traction. adidas Performance Men’s Mundial Team Soccer Shoe – The Mundial Team soccer shoe made by Adidas is a solid choice for games played on hard ground or 3G artificial surfaces. The shoe offers traditional styling and is both lightweight and solidly made. Soft uppers made from Kangaroo leather allow the show to be responsive, and dual-density polyurethane midsole ensures comfort. The tight stud pattern was designed to provide maximum traction on unyielding surfaces, and the outsole features a stitched toe wall and polyurethane wedge. The Mundial Team soccer shoe is a mid-range item. ASICS Copero S Turf soccer shoe – ASICS has developed a reputation for producing athletic apparel that is both stylish and highly functional. The Japanese company ensures that the Copero S Turf soccer shoe provides a personal fit by using two layers of memory foam mold the heel and line the collar. Reinforcing the heel and stitching the toe adds durability, and the ASICS Trusstic system provides additional support. The system features a supportive shank running from the forefoot to the arch. The Copero S is available at a mid to high range price point. Puma King Allround TT – Puma have been associated with soccer for decades, and the Allround TT is a lightweight shoe that offers traditional styling combined with the latest athletic apparel technology. 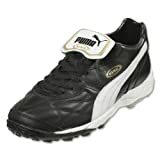 The old school looks of a fold-over tongue and a quilted leather upper may encourage athletes to try these shoes on, and the PUMA CELL cushioning provides exceptional comfort. Puma’s EverTrack stud design is also innovative, and it allows players to maneuver easily and control the ball easily on hard surfaces. Prices for the Allround typically range from mid to high level. adidas Performance Men’s Samba Classic – Traditional styling is also a major selling point for the Samba Classic. The shoe features the iconic three stripes that have become synonymous with adidas, and comfort is provided by and EVA insole and a uppers made of full-grain leather. The flat gum-rubber soles are designed to provide traction on hard flat surfaces, and these shoes are ideal for polished indoor floors or older sand based artificial surfaces. The Samba has been a mainstay of the adidas lineup for many years, and it remains one of the German company’s biggest sellers. adidas Performance F5 Tf J –Traditional is one word that is unlikely to be heard when players discuss the Performance F5 Tf. The brightly colored boys shoes make a bold statement, and adidas backs up the space-age looks with impressive technology. The synthetic uppers feature a soft textile lining, and the sockliner is made from ethylene vinyl acetate. The shoes are both lightweight and easy to clean, and the TRAXION outsole provides players with ample grip on artificial pitches. Performance F5 Tf shoes are also a good choice for outdoor hard surfaces. The shoes can picked up for a mid-range junior soccer cleat price. Choosing the right soccer shoes is sometimes made difficult by a dizzying array of choices and an abundance of propitiatory technology. Establishing a budget will whittle down the choices considerably, and opting for either a traditional or contemporary design will further narrow the field. Turf soccer cleats should fit snugly at the heel and toe to improve onfield performance, but they should never be tight. Comfort is the key, and ill-fitting shoes will generally become more unbearable as the game goes on. While the shoes produced by different athletic apparel companies may look similar, the technology used in their construction may be very different. Some Nike soccer turf shoes feature extremely thin and pliable uppers made from kangalite, but adidas often uses a breathable mesh. Leather uppers will stretch slightly as shoes are worn in while shoes with synthetic uppers will generally retain their fit from new. Kangaroo leather is soft and molds well to the foot, and it is often found on soccer shoes at the higher end of the price scale. Full-grain leather is not quite as supple, but it is durable and less expensive. While buying soccer shoes for growing kids can be expensive, parents would be unwise to buy shoes that are on the large side to allow children to grow into them. Shoes that are too large make sprints and fast turns more difficult, and they may also lead to to painful injuries. Experienced soccer players will normally have a variety of different types of soccer shoes for different weather situations or different types of surfaces. If you tend to play a lot on grass then having a high quality pair of turf soccer cleats may help you to really improve your game. Playing soccer on turf brings different challenges than playing indoors or on other harder surfaces and it’s important to choose a pair of cleats that will give you both a high level of comfort and a rock solid sense of stability whilst you play. There are several different types of turf shoes that you can choose from, some of which can be quite expensive. The cost of the shoes will depend on a number of different factors including the brand, the primary material of the upper part of the shoe, and any special features it may have. While some people prefer to have high quality leather cleats, these are not going to be the ideal shoes for every situation. Leather shoes can provide you with the ultimate comfort because of the way they are able to adapt to the size and shape of your feet, but synthetic shoes are often more affordable and are a better choice on wet fields. Leather shoes have a tendency to get extremely heavy when they get wet, but synthetic shoes stay lightweight and dry much more easily. This entry was posted in Cleats on February 23, 2014 by admin.